Guys, I've been a crappy bad blogger. I'm not apologizing for it, since it's my blog and I don't make an income off of it, nor do I think anyone out there has even noticed that my posts have been few and far between the past two weeks. But, I have just not been into it lately. It's not like I have had a secret project in the works or anything. I've just been uninspired. So I wanted to apologize to all of you wonderful people have commented on my blog - I am going to visit all of you soon, I promise! In other news, Easter was absolutely wonderful. I got to spend some time with both Eric's family and mine (my family decided that we are getting too big so we were delegated to a pavilion in a park). We had a great time of worship at church and we ate a lot of great food: challah bread, ham, some nearly butchered deviled eggs that I made, cookies, etc. It was a wonderful day. I hope everyone is having a good week! Everyone has been in good spirits around here - the weather has been beautiful in Oklahoma lately! I'm glad you had a good Easter, and hopefully inspiration will find you again soon. Your dress is really cute! Where do you guys go to Church? We just started attending one...finally got brave enough to go out with the baby! I agree with you- I need to stop posting just to post when I'm not in the mood. I feel like I get that way every couple weeks. 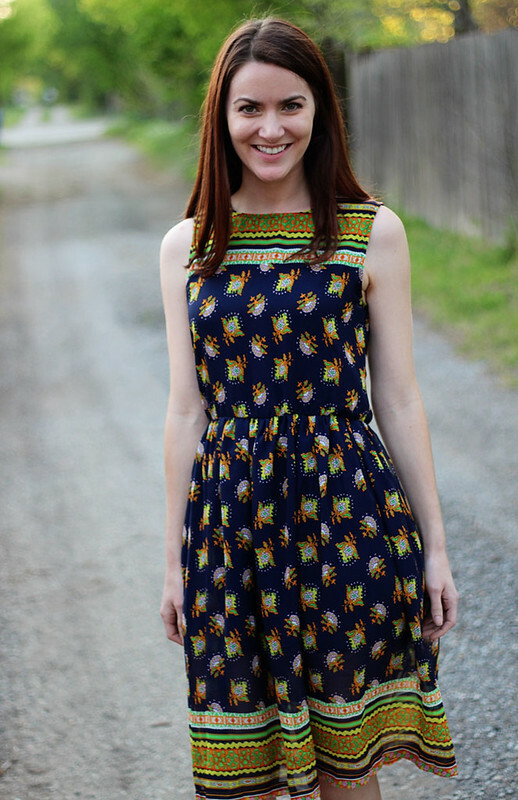 I love the color and print of your dress! Love your dress! It's a-ok to blog when you want. It's your space! Happy Easter! Sometimes a break is needed, it's your blog so you get to decide. :) I love challah bread! Love the pattern of your dress! Hope you will be inspired to post again soon! I've been the same way with blogging lately. I could easily just post my outfits with no other content, but I just can't do that. I like that you're not apologizing for it. It's a blog, and it's a hobby! I always giggle when I read "sorry I didn't post yesterday!" ....ohh I didn't even notice.... hahaha. Glad to hear your Easter was good! This dress looks amazing on you! That dress is right up my alley. I love a good printed dress and the silhouette is so good on you. Sometimes I get in a funk with blogging. I just step away for a few days to regroup. Like you said, it is just a hobby. The pattern of that dress is awesome on you!! Seriously, you look great! The jacket is a nice finishing piece, too! I absolutely noticed! lol. but that's cause I'm a nutter. But if you don't feel like it, you don't feel like it. It's your blog, don't force it! that jacket is seriously awesome and I need it in my life. Dress is super cute too! In regards to blogging, I feel like you have to do what is right for you. However often or whatever content you like. So glad you had a lovely Easter! The weather was just gorgeous. What a nice dress, I love the colors and print! You could pair all kinds of colors with it! I love challah bread!! :-) The boots with the dress is just my style. I know, I don't make money with my blog as well and when life gets very busy, May blog is missing new posts.To keep be inspired as well is not the easiest thing, but inspiration is inside us and we just need to find way how to let it come out. You look so pretty. That dress is lovely. I"m so glad that you had a good Easter. We missed you around here, but I totally understand. Sometimes I don't feel so inspired either, and that's totally okay, girl! What a beautiful dress, I love the print! I'm glad you had a great Easter! Your photos and outfits are all just too adorable! Loving it! I am glad you are back! Having just discovered your blog, I really like it. I find it to be one of the blogs I really enjoy. I love that dress on you. It is so pretty! And that jacket is just perfect for it! Also, I love Harry Potter, too. Like, LOVE. Sorry, that seems random, but I just read that post. I've noticed your absence, but only because I miss seeing your face. Also, I am really curious to know what you're wearing when you're not posting your outfits. And I'm curious to know what you're up to. But alas, I'll live. But only because your dress is stellar. It's great to hear that you had a nice Easter! I've noticed that I hadn't seen you around in a little while, but we all sort of "disappear" from time to time. I find my inspiration levels go up and down too, so I know others have the same issues. I always feel like it's all about quality over quantity, so if I'm not inspired, there's no point on putting up a bad post....since I'm not making money either! At first, I thought you said Hakuna Matata at the end, and then I realized it said Oklahoma. How did I even confuse the two? I don't understand my brain sometimes. However, I do understand why I love that dress. It's such a fun print. And that jacket fits you like a dream. I can relate to feeling uninspired sometimes! Glad to hear you had a great Easter. This dress is adorable! I go through times as well where I'm not feeling too inspired! I think every blogger goes through this. 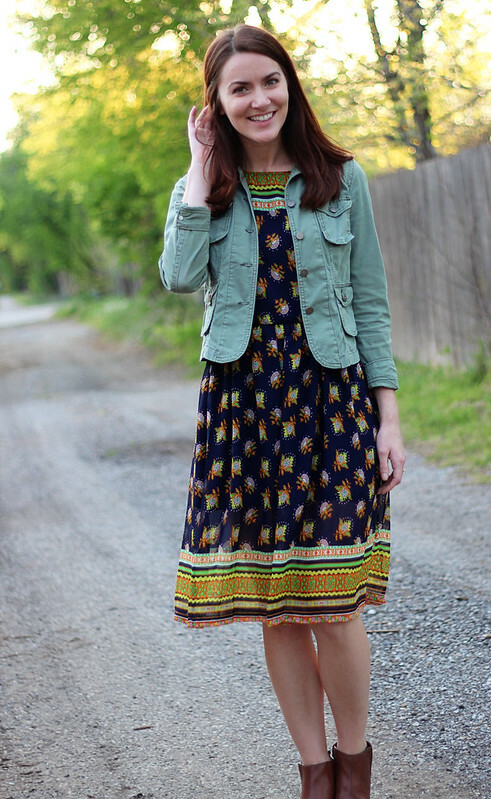 That dress is really cute with the denim jacket! Great dress! I think we all go through those times. Sometimes you just need a break. I'm glad you had a great Easter! Don't worry about the absence---your long-time fans will understand. Also, I love the print on that dress: I can't tell what exactly it is, but it's beautiful! I totally go through phases when I have no interest in posting and there's nothing wrong with it! I feel guilty about it sometimes, but usually taking a mini break helps me actually want to blog again! I absolutely LOVE that dress. It fits your small frame absolutely perfectly, has such a fun print, and is a great length. Super super cute! I've come to the decision that navy blue dresses just look fantastic on you! I love the print and just everything about that dress. No worries about not posting! Things happen, I've been in that boat before too! Glad you had a wonderful Easter with family! I completely understand! I just went through the same phase blogging as well. Sometimes it's hard and you feel guilty but sometimes the break is needed too! Helps to get your inspiration back! Love the dress too!! Gorgeous print! 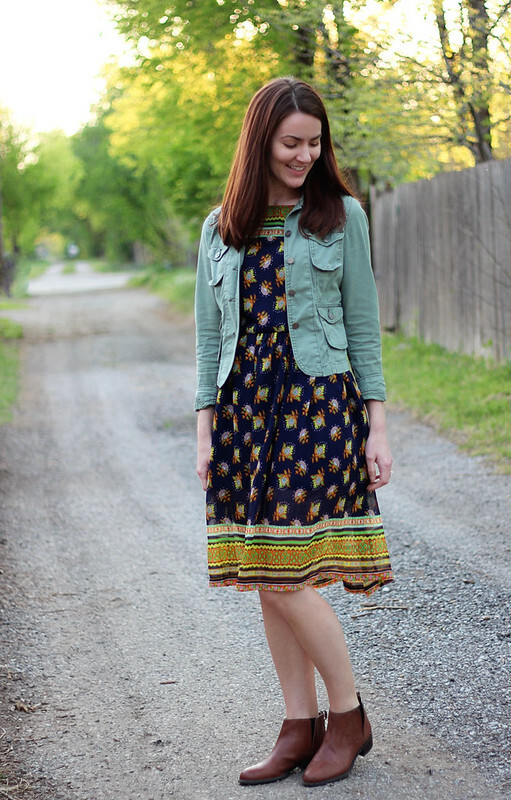 That dress is so pretty and it is meant to be in perfect harmony with those brown booties (that I love). The little Military Jacket was a great addition. No need to apologize about taking time off. We understand. At least I know I do. =) I am glad you had a great Easter. Hi, Sorry you are feeling burnt out...hopefully you'll get your spark back soon! Sounds like you had a wonderful easter with lots of good food...cute outfit too! I am pleased to hear you had a wonderful easter. Love your dress. The pattern is incredible! It seems pretty normal to go through varying levels of motivation with blogging. Hope you find the right level so youu continue to enjoy it, we love your posts. love it! you look fabulous!